Our last production release really didn’t go as smoothly as I might have liked. I feel as though I have spent the last month or so just…running, hell bent for election, trying to figure out how to handle the latest curve ball that was fired at me. From a cannon. The keyword for this last cycle appears to be “miss.” When the requirements didn’t actually describe what was wanted? That was a miss. When what was coded worked, but does it so slowly that it would almost be faster to do it by hand with a 10-key? That was a slight miss. When half of the things in the release weren’t tested at all before they went to production because there simply wasn’t enough time to do the testing properly (and not enough appetite for saying ‘hold the phone, we better fail this out of this sprint and come back at it next month’)? That was a rather unfortunate miss. When half of the SSIS packages weren’t deployed period due to a fascinating example of miscommunication? That was a huge miss. It’s funny how these sorts of words and phrases will appear in the business world. A couple years ago, the phrase “action the learnings” buzzed around for a while. That one set my teeth on edge. Every time someone would say it, I would just cringe. But business is never content with the status quo, so, now our office is abuzz with miss. It’s a miss, it’s a small miss, it’s a huge miss. And it now has legitimacy, because I’ve started a drinking game over it. Any time our project manager refers to something as a miss of any sort in a meeting, I must take a swig of whatever beverage I have at my desk right then. Meanwhile in other news, after a ridiculously long period of no project at all, I suddenly took it into my head that I wanted to make something in the lace category. Because there is something wrong with me. Something very, very wrong with me. So on the first of July, I cast on the center portion of Stripes and Torchon Lace from Victorian Lace Today. Woo hoo! I said to myself after the first 2 repeats, when the pattern was settling into my muscle-memory and the center part was starting to grow pretty quickly. That’s right, lookit how FAST this thing is growing! I IZ A WIZZ-ARD 4 KNIT-TING! 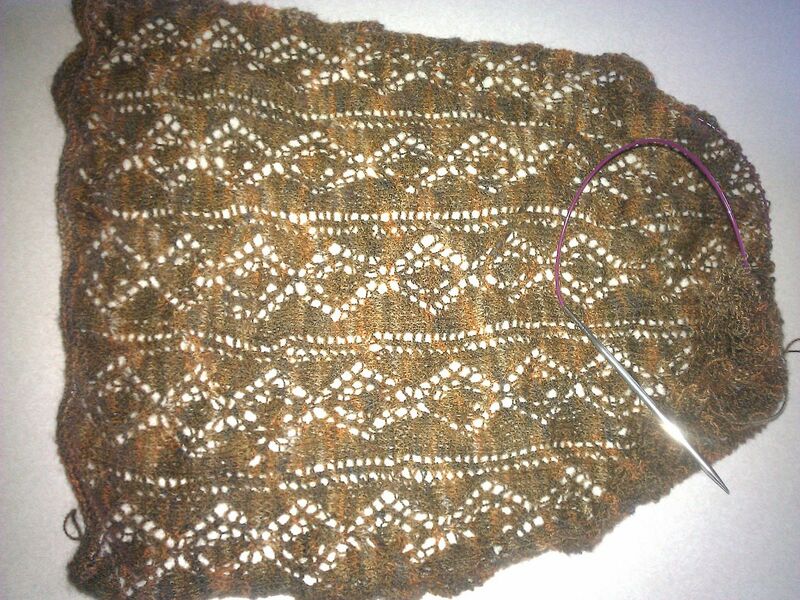 …and then, well, I’d finished all the repeats for the center. And I was giving myself high-fives for being “almost done” and congratulating myself on how clever and also speedy a knitter I was, and other ways by which we invite the Imp of the Perverse into our lives. And then I confidently launched into the knitted-on border. And then I tore the first two repeats out and started over. And then I tore them out again and started over. 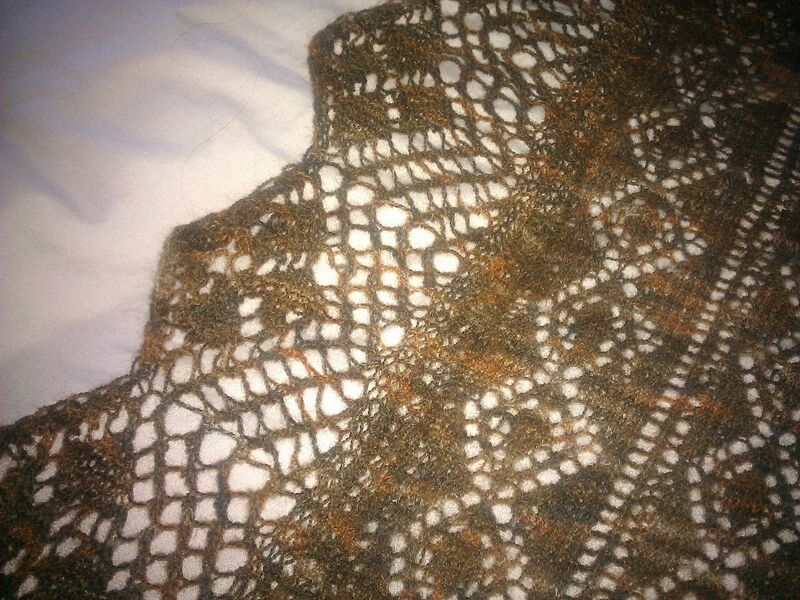 And then I confidently knitted a repeat of the pattern onto the edge of the shawl again. And tore it out. Again. And started over yet again, having identified my problem as being not one of counting stitches, but rather of having a bad habit of not always incrementing my row counter, because I thought I wasn’t getting up any time soon and was therefore “safe” to “just remember” that I was on row 17 now, not row 11. And secondly, hahahahahaha, not getting up any time soon! I SLAY ME!!! Yeah. Even the kittens have figured out that my lap is only acceptable if there are no other laps to choose from…because mine tends to vanish so suddenly, and at frequent intervals. Having finally taken to heart the necessity of incrementing the counter, EVERY SINGLE TIME, suddenly I started making some headway. I’m still having a bit of a wrestle with that edging, which has more rows in the chart, and for some reason both my brain and my muscle memory are refusing to “imprint” even one row of it (well, that’s not entirely true…the wrong side is basically a ‘work even,’ so, I’m nailing that side)…so I’m having to keep my nose right up against the pattern the whole time, which makes for slower, more tedious knitting. 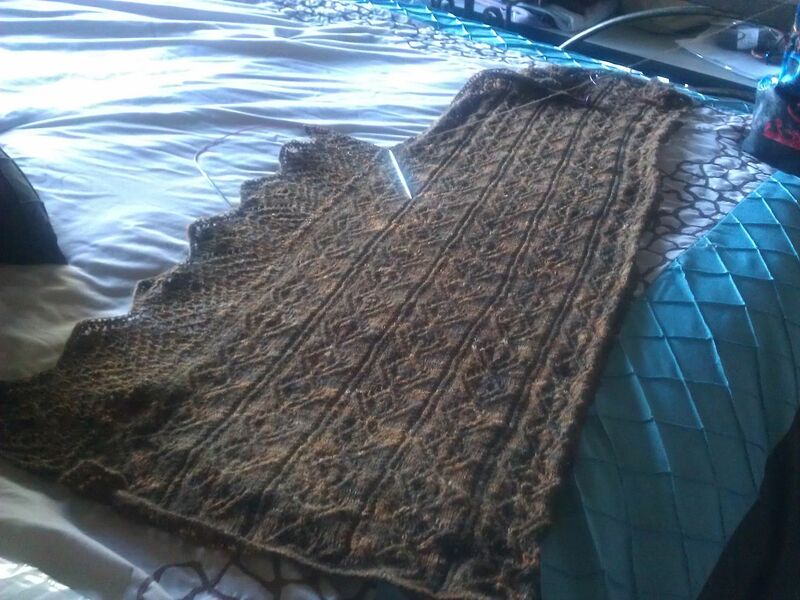 I feel even more good about it when I kind of stretch it out so that it starts to look at least kinda how it will look after it has been dunked-n-stretched for its final blocking. And that’s pretty much what I’ve been up to all this long time between posts. Losing my mind at work due to misses large and small, and then “relaxing” by attempting to knit a border on a lace shawl-thing. Tune in next week, when I might do something WILD and CRAZY, like having crackers and diet soda for dinner, film at 11! Hahahaha! So glad you're back with us on the Dark Side, all us Knittas here. I have the book, and will take a lookee at that pattern again, thank you. I swear, I'm going to get a badge with "SHUT UP I'M COUNTING" on it. You do know, don't you that "A business" is the collective noun for a group of ferrets. I hear you on the work thing. I'm still caught up in that sort of hell, myself, although around here it's called "The Plan" or "The Forecast". I call rectangular shawls "wraps". Don't know if I am right, but it sounds right-er and less grandma-y than shawl.